After an unprecedented series of natural disasters threatened the planet, the world’s leaders came together to create an intricate network of satellites designed to control the global climate and keep everyone safe. However, something has gone wrong - the system built to protect the Earth is attacking it, and it’s a race against the clock to uncover the real threat before a worldwide geostorm wipes out everything...and everyone along with it. Full disclosure: after reading the (largely derisory) reviews for Geostorm, I decided that Dean Devlin’s troubled movie was not for me. I’m just not a huge Gerard Butler fan. I find his performances rather unsettling - he always seems in danger of spontaneous self combustion. In addition, life is far too short for bad movies. Am I right? Well, in this case, maybe not. Perhaps, if you are prepared for it, a "bad" movie can be (intentionally or not) rather entertaining. Devlin's film. These reviews did not, you understand, suggest that the movie was actually good. Instead, they argued that Geostorm deserved a watch because it is so silly. As a result, the moment Geostorm became available via VOD/DVD, I decided to take the plunge. And, while it wasn’t as entertaining as I had hoped, it is a lot of fun with moments of genius-level ridiculousness. This movie is certainly far from a Geostinker. Sadly, Geostorm takes far too long to get to the all out crazy fun. The first act of Devlin’s film is actually quite dull. We have plenty of tedious exposition to get through before Mr Butler can do his world saving best. Gerard Butler is Jake Lawson a (I kid you not) meteorological scientist who has created a Skynet-style network of satellites capable of neutralising the world’s most dangerous weather events. We are spared the exact science of this system (called Dutch Boy - I get the reference, of course, but it still sounds very, very wrong) because where to begin with such a ludicrous concept? We are simply asked to trust the voiceover of Lawson’s teenage daughter. When Dutch Boy appears to malfunction, there is only one man who can save the planet… or, to be precise, two men with the help of two women. Lawson’s brother, Max (an oddly miscast Jim Sturgess complete with an extremely dodgy haircut), is left on Earth while Jake is up on the Space Station attending to Dutch Boy with Ute Fassbinder (Alexandra Maria Lara). It is here that the movie makes one (of many) fatal mistake. Stranding Gerard Butler up in space leaves him strangely removed from all the action. Yes here be heroics but there’s only so much he can do in this confined environment. We really need him on the ground. On Earth, Max is facing an utterly devastating series of large scale weather events (CGI storms that manage to hit every global cliche there is). He has remarkable access to US President Andrew Palma (Andy Garcia looking utterly bewildered by the whole affair) and is also maintaining an illicit (and unconvincing) relationship with Abbie Cornish’s under-used secret agent, Sarah Wilson. We also get an appearance from Ed Harris (always unsettling for anyone who has seen mother!) who looks utterly furious that his agent allowed him within 1000 miles of this mess of a plot. 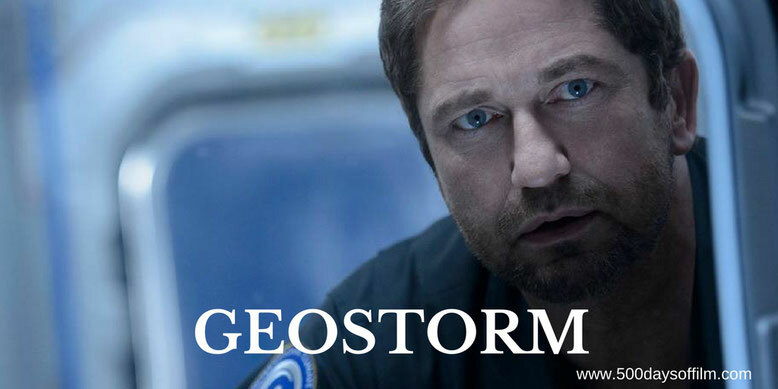 However, as Geostorm moves into its final act, a strange sense of joy descends as all narrative meaning and logic is thrown out of the window in favour of scenes of sheer madness. None of it makes a bean of sense but it sure is fun while it lasts. If you have, what did you think of this film? Let me know by leaving me a comment in the box below or via Facebook or Twitter (@500DaysOfFilm).